Discipleship doesn’t happen in isolation. We need God and each other. Relationships take time, can be messy, feel risky, and cause disruption. So where do we start? By praying for God to open our eyes to notice people, especially those within our social circle. The first time I was invited to an evangelistic meeting, I jumped at the chance because Pastor Louis had helped my family get settled in a new town. I didnʼt know any other teenagers and was eager to meet new people. Adventist research reveals that 80% of people say that an acquaintance or relatives are the reason they join our Church (research from Sahlin, Monte. Friendship Evangelism). Guess what the second reason is? Small Groups. Two thirds of people who become Jesus followers say a Small Group loved them in. Building a culture of Grow Groups at PMC is not about a program. It’s about building connections that open us up for the mission we’ve been given: “Go and make disciples” Please join us. In honor of Dr. Martin Luther King Jr. and in light of recent events in our country it is now time, more than ever, to band together as one to increase awareness about the issues that certain communities in our country face. Poverty, mass incarceration, and fatherlessness are all veritable problems in the black community. 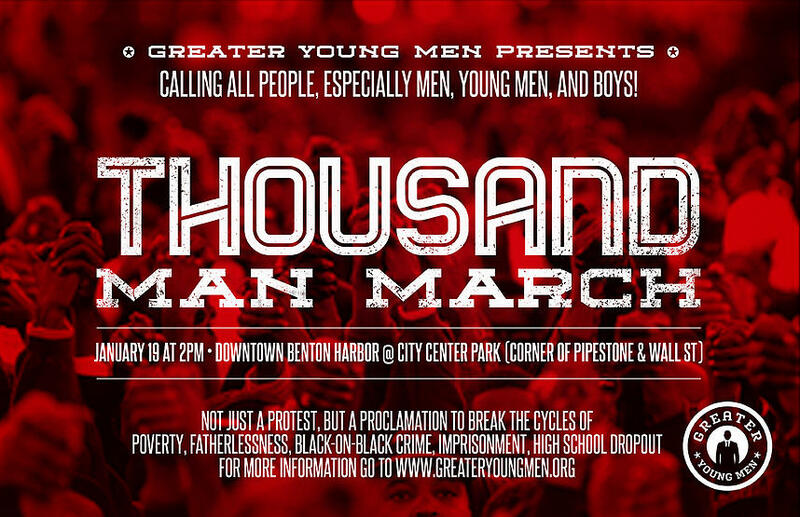 The Thousand Man March is an event planned by Greater Young Men, a movement started by young men with the intent of inspiring change in today’s society. The goal of this peaceful march is to proclaim the need to break the cycles that enslave a large portion of African Americans. The Thousand Man March will take place on Monday, January 19 at 2:oo p.m. Anyone and everyone who shares the desire to see our nation transformed and start living up to the ideals of justice, equality, fairness and respect for all humanity is invited to take part. Fathers and young men are especially welcome. While Satan incites men to brutalize others and blame their misery on a loving God, the hand of Omnipotence turns the suffering of nearly 45 million of the world’s forcibly displaced people into a blessing – and a means of fulfilling the prophecy of Matthew 24:14! The members of the Reach the World - Next Door GROW Group learn of the strategic opportunity to share God’s end time message with refugee Christians, Muslims, Buddhists and, Animists. Members combine the four discipleship aspects of CONNECT • GROW • SERVE • GO by establishing friendships, and visiting homes with food, clothes, toys, and prayer. We encourage you to join this or another GROW Group. Check out the new GROW Group catalog in two weeks! Jazz up your meals with an international flair. Watch a lively cooking demonstration. Ask a dietician your health questions.